Thursday, March 23, 2017 from 12PM-1:00PM at the State Capitol in Room 317. A discussion with Assemblymember Ash Kalra, the first South Asian legislator elected to the California State Legislature. Please join the California Latinas for Reproductive Justice’s (CLRJ) annual policy briefing on Monday, April 4th in room 125 from 2-3:30pm. We’re hoping you can disseminate this information through your list serves and invite all interested and new staff to the event. CLRJ’s policy briefing, in partnership with the Latino and Women’s Caucus, will discuss the “State of Latinas” in California as it relates to reproductive justice and policy. The briefing will discuss key findings on health, education, and economic security, in order to inform policies that further advance the overall well-bring of Latinas in California. Free lunch will be provided for those that RSVP in advance. To RSVP and see more information, please click here. If you have any questions or would like more information contact Myra Duran at Myra@clrj.org or send me an email. APICA held its annual General Membership Meeting and Board Elections at State Capitol Room 317, from 12 p.m. to 1:30 p.m. The APICA executive board consists of the President, Vice-President, Secretary, Treasurer, Community Affairs Director, Membership Director, Communications Director, and the Fellows/Intern Outreach Coordinator. Board positions were open to all paid and present members at the general meeting and only paid members were eligible to vote. APICA co-sponsored a welcome reception for API Legislative Caucus members, mayors and council members on January 20, 7 pm., at Chops (1117 11th St., Sacramento). Sponsored by the League of CA Cities API Caucus and the California Asian Pacific Islander Legislative Caucus Institute. APICA and the API Legislative Caucus Institute hosted a brown bag (pizza) discussion with Dave Low, Executive Director and Director of Governmental Relations for the California School Employees Association. The event took place in Room 317 of the State Capitol from 12 p.m. to 1 p.m. Mr. Low talked about working with the third house, the skills necessary to be a successful lobbyist, labor priorities in 2016 and more. 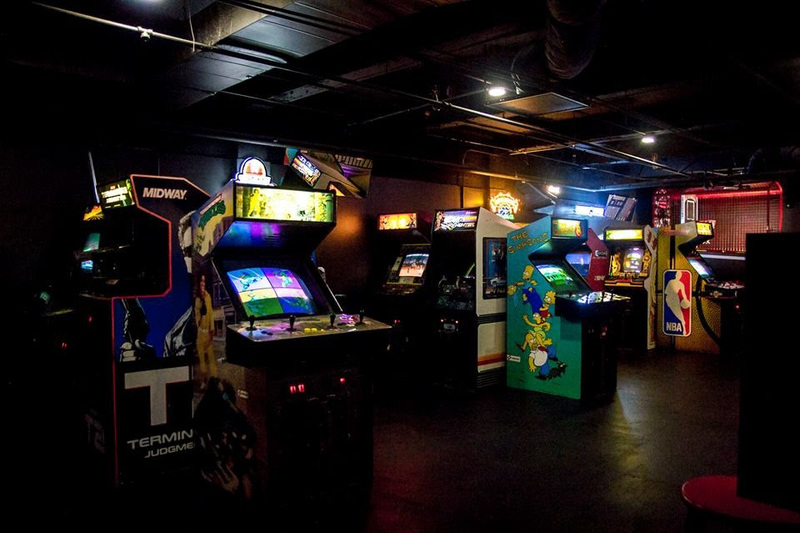 The 5:30 p.m. reception took place at Sacramento’s Coin-Op Game Room to help welcome the 2015-16 Capital Fellows. The event provided free turkeys, dental kits, medical checkups and healthcare enrollment options at Luther Burbank High School (3500 Florin Rd., Sacramento 95823) from 8 a.m. until 2 p.m. The California Latino Capitol Association Foundation, APICA and the California Issues Forum hosted “VISA’s Credit Card Industry Briefing” on Monday, November 9, from noon to 1 p.m. at State Capitol Room 317. The briefing covered recent changes in the credit card industry, including new and innovative payment methods, its evolving technology, and the recently adopted rules regarding credit card security and fraud. APICA and the API Legislative Caucus Institute hosted a brown bag discussion with Mona Pasquil, Governor Jerry Brown’s Appointments Secretary. Mona discussed her career, the gubernatorial appointments process and diversity in state government. The discussion took place in the Governor’s Council Room at the State Capitol on Wednesday, November 4, from 12 p.m. to 1 p.m. 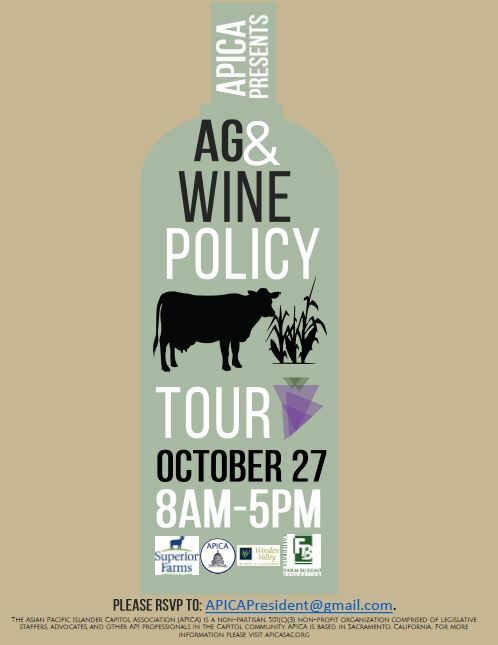 Following on the success of our technology policy tour in San Francisco and Silicon Valley last December, APICA’s tour this year focused on agricultural and wine policy in Dixon and Fairfield. 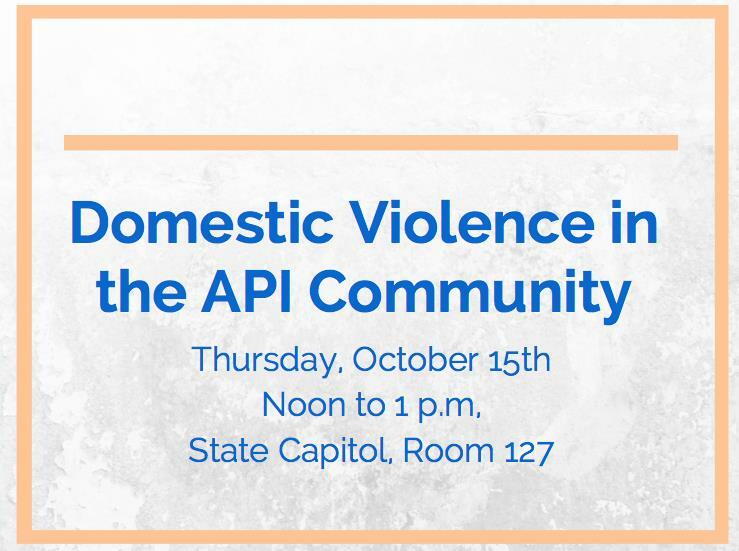 The tour was held on Tuesday, October 27, from 8 a.m. to 5 p.m.
Panel discussion hosted by APICA, the API Legislative Caucus and the Legislative Women’s Caucus on Thursday, October 15, from Noon to 1 p.m. in Room 127 of the State Capitol. Boxed lunches provided by Assembly Member Jimmy Gomez to the first 25 attendees. Panelists included: Nilda Valmores — Executive Director, My Sister’s House; Sarah Khan — Project Specialist, Asian Pacific Institute on Gender-Based Violence; Laura Vu — Community Health Worker, Hmong Women’s Heritage Association; and Imelda Buncab, Training and Technical Assistance Coordinator, California Coalition Against Sexual Assault. Sunday, October 11, 2 p.m. – 5:30 p.m. at Sacramento State’s University Union (6000 J Street, Sacramento 95819). APICA was a community partner for this FREE event featuring elected officials, cultural performances and more. 5:30 p.m., Bento Box (1101 16th St., Sacramento). 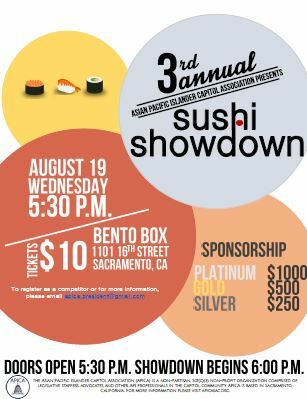 Our 3rd annual sushi eating contest, Sushi Showdown provides the financial support for all of APICA’s programs, including our internship program for college juniors and seniors. When: Friday, June 26th, 12 p.m. to 1:30 p.m. The Asian Pacific Islander Capitol Association, California Latino Capitol Association and the California Capitol Black Staff Association hosted a mixer to celebrate Asian Pacific Islander Heritage Month. 9:30 to 11 a.m., 2nd floor patio by Capitol Room 2175: Food provided by My Sister’s Café, a volunteer-based support program for My Sister’s House, which provides help to domestic violence survivors to “get back on their feet” financially. Free lunch hosted by APICA at the Speaker’s Office of Member Services at the Legislative Office Building (1020 N St., Room 460). This was an opportunity to meet APICA’s new Board Members, mingle with other fellows and interns, and of course, have a free lunch on us!